The World Bank has warned of new threats to efforts to reduce poverty in the developing world.In its twice-yearly assessment of global economic prospects, the bank forecasts only a modest increase in growth. The report also says that there has been an increase in risks to the global economy. But there are some relatively upbeat elements to this report.The World Bank does think that global economic growth will pick up this year.The rich countries will gain some speed and the emerging economies will grow more rapidly than last year. But then 2015 was, for the developing economies, what the bank calls a post-crisis low in terms of economic growth. This year’s forecast, 2.9% for the global economy compared with 2.4% last year, is still not robust.Nor is the forecast for the developing economies, at 4.8%. South Asia, led by India, is described as a "bright spot". But among the other largest emerging economies, sometimes known as the Brics, growth is expected to slow further in China, while Brazil and Russia are likely to remain in recession. The Bank’s chief economist, Kaushik Basu, said there is greater divergence between emerging economies. He also says the risks to the forecast have increased in the last six months, "particularly those associated with the possibility of a disorderly slowdown in a major emerging economy". He didn’t name the emerging economy that was behind that remark, but it’s not hard to guess that it was China. 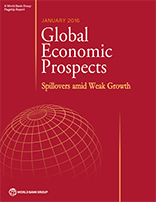 The report warns that weakness in major emerging economies could pose a threat to hard-won gains in raising people out of poverty.It expresses concern that poverty will become increasingly concentrated in economies based on the exploitation of natural resources, many of which are in sub-Saharan Africa, where extreme poverty is already prevalent. The natural resource economies have been hit by the recent fall in the prices of commodities. The report says many poor households in these countries have also been hit by higher prices of imported goods, resulting from sharp declines in national currencies. The report warns: "Even the limited gains in poverty reduction made over the past decade could rapidly reverse." It’s worth adding that the growth figures for the world and for groups of countries reported by the bank should not be directly compared with the figures given by the International Monetary Fund (IMF). That’s because there are two ways of adding up country figures, and the two agencies choose to highlight different ones. But comparable figures are there to be found. Using the IMF’s preferred method, the two agencies’ most recent global growth figures for this year and next are the same; using the bank’s method they are slightly different, but still very close.